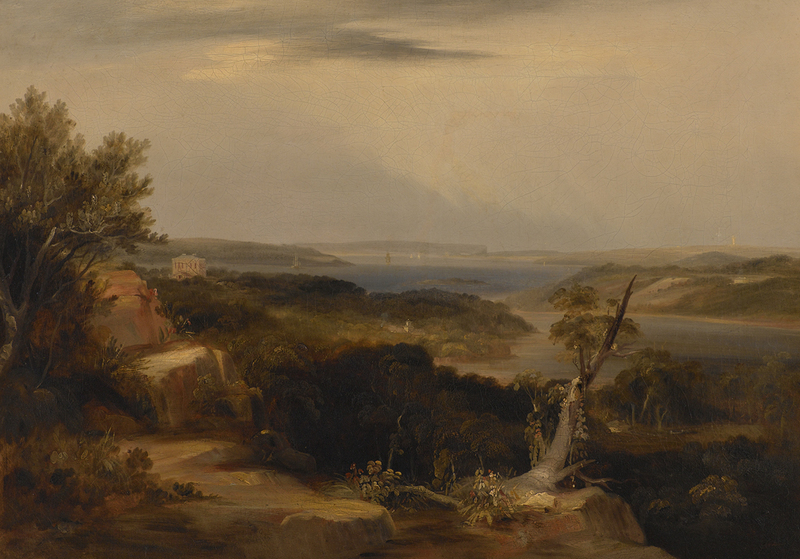 View from Craigend (1840) is one of the oldest works in the Mosman Art Gallery Collection and makes a substantial contribution to The Balnaves Gift. It bears all the hallmarks of Conrad Martens’ many topographic scenes of Sydney Harbour, with its fluid picturesque renderings of sea and shore and the atmospheric affects of light. The property Craigend was the home of Sydney’s Surveyor-General Sir Thomas Mitchelluntil 1837. The Greek Revival mansion on Woolloomooloo Hill at Darlinghurst was one of Martens’ most popular subjects and understandably so – Craigend was considered to be one of the finest estates in the colony. Martens depicts where the view looks northeastwards across Rushcutters Bay to Sydney Heads in the distance with Macquarie Lighthouse on the skyline and Darling Point to the right. On a hill to the left foreground is Rosylyn Hall while the stables of Elizabeth Bay House can be seen in the middle distance. Conrad Martens was born in England in 1801 and travelled to Sydney in 1835. Martens received patronage in the colony from powerful figures such as Governor Bourke and Governor Gipps who were interested in the promotion of science and the arts in the colony. Influenced by the European tradition of depicting landscape in atmospheric terms as practiced by the 17th century French artist Claude and later by Turner, Martens’ reaction to the Australian light suffused his works with a pearlescent dreamlike quality.